It doesn’t take long, however, to realize that Mohan’s obsessive and often tyrannical behaviour towards his children is only a brush-stroke on a much larger canvas, one that depicts the “great nastiness” and institutionalisation of India’s national game. His plan to “raise champions” seemingly pays off when Anand Mehta, a wealthy Gujarati man, agrees on 50,000 rupee (ca. £600) loan, although it doesn’t, since the much-coveted freedom he envisioned the money would deliver to his family is quickly folded and shoved in the sponsor’s pocket. As Tommy Sir admits, it all eventually boils down to “one big lie […] a single deceitful statement: ‘Cricket in India still smells good.’” In reality, however, the smell is but a miasma: of illegal betting, match fixing, and frauds committed on the backs of impoverished kids with no options. But corruption is not India’s only concern, as the sardonic narrator continuously reminds the reader. When Manju, the younger of the two Kumar brothers, meets Javed Ansari, a Muslim cricketer from an affluent family, the story takes an unexpected turn. Manju comes to see Javed as the “Tiger-King,” a symbol of individuality and freedom, “the only one unenslaved and unmastered … like the most gorgeous thing created.” Questions of class, religion, and sexuality clash with the static vision of happiness and reconciliation promised by the cricket, and in a centripetal fashion the traditional game is displaced and the periphery centralised. Repression may be a red-hot distortion of the truth but what follows it, acceptance, when a man finally examines his heart and says, ‘This is what I must have been partly or in whole,’ is hardly liberation. Nothing much changes because you have stopped lying to yourself. A moment of relief, yes, the sense of shedding some terrible weight — but it passes. As Manju, “alone, in Kattale [the Darkness], like Sindbad,” seeks his way into the “India of Light,” it’s not only society and family he struggles against, but also his own self. 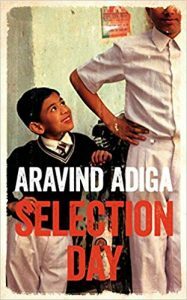 This contemporary novel about India comes at a perfect moment, when questions about one’s identity – personal and national – desperately need strong answers. Selection Day lends its wisdom like a Shakespearean play. It has the perfect equipoise of form and content, a sensory slice-of-life, which reads like a long Blake poem. At times, the excellent psychological construction of these complex characters feels like Tolstoy’s work, but no, it’s Adiga’s, his own literary brilliance, full of insight and sensitivity. A flawless work.